As I stood up to speak at the John O Connor Writing School and Literary Arts Festival Programme Launch, I had a wee moment…one of those quick stock-takes I do on the hop from time to time. In a weird parallel-universe-type symmetry, at that time, back in 2016, I was meeting up with Catherine Barry the founder and organiser of the Los Gatos Irish Arts and Writers Festival just up the road from where I lived in California. They were preparing for their first festival to take place at the beginning of October. As it turned out, I missed both those festivals that year because we moved to Paris. I was flabbergasted and nodded vigorously. She offered to take a photo of the piece of paper that was by now somewhat bend out of shape from my sweaty hands clutching it for the past hour and a half. “No need. Sure, have the whole thing,” I said, shoving it towards her, limp creases and all. She read aloud the line she’d liked and thanked me, little knowing how much she’d made my day. Armagh is a special place, not only to those who live here but to visitors who come to enjoy this beautiful ancient city with its friendly people. It’s not until you leave Armagh that you realise how truly special it is. I think about John O Connor on his travels in hot dusty Australia and wonder, was he homesick for Armagh, did he crave the tang of a Bramley apple and the spice of our humour? At the time, I was already mentally packing up my life abroad – the tug of home, held at bay for a good half dozen years, had finally gained traction. But what would happen to my writing? When I’d last lived here, I’d been a biology teacher – now I was returning as a writer – sure, it was like I was a totally different person. I’d only been settled back in Armagh for a month when I attended my first John O Connor Writing School Literary festival last year. This cultural feast served portions of literature, platters of poetry and servings of song – all seasoned with plenty of craic! Writers need community. You sit in a room all day by yourself, even worse – you hang out in your own head for hours at a time. The John O Connor festival is a place to meet and connect with other writers, to practice your craft and to share ideas and resources. That’s where I first heard about ‘Women Aloud NI’ whose aim is to raise the profile of women writing the North. I joined and as a result, have had many opportunities to showcase my writing. After the 2017 festival, I wanted to keep that sense of belonging, of community amongst writers alive and promote Armagh as a place where writing happens. That’s why I started the Facebook Page and group – Armagh Writers – a group for writers who are from or who live in Armagh. I also volunteered on the John O Connor Writing School board and have been in the role of secretary since January. To draw writers to and to provide a platform for writers in Armagh, another Armagh writer, Réamonn Ó Ciaráin and I started Flash Fiction Armagh. We’ve been included in the Food and Cider Festival at the end of this month as Flash Fiction in the Orchard and are collaborating as part of The John O’Connor Lyrical Literary Lunchtime on Sunday 4th November. Festivals like this one enable our communities to thrive, whether that be the writing community or the wider community. Everyone needs the arts. Humanity needs language, in all its forms, to communicate and express our thoughts and feelings to each other so we may recognize ourselves in others, rejoice in our similarities and learn from our differences. 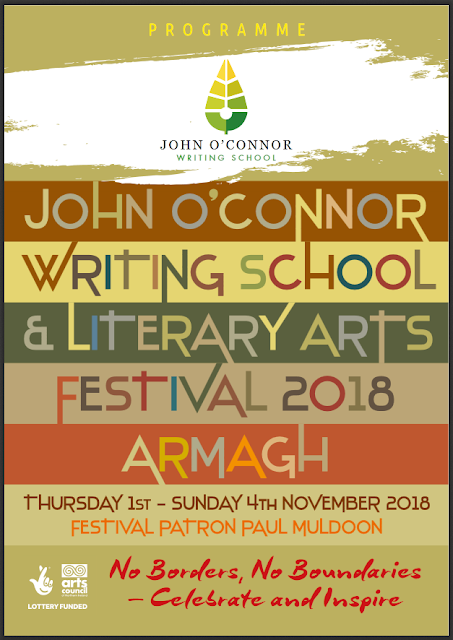 And this is where the John O Connor Writing School Literary Festival plays a pivotal role in our city – for it represents the things that make Armagh great – namely, culture, creativity and community. Be sure to book your tickets ASAP to avoid disappointment. It’s a brilliant weekend. For a reminder of how last years festival went click here.